Science is forever trying to model nature. By simplifying its complexity, or extracting its structures into new modes, science can begin to understand how living things work. One clever way to study biology is to make virtual 3D models of living creatures. Hollywood special effects artists and hackers often model real animals in 3D in order to bring them to the screen in a controlled and interactive way — just for entertainment — but the same techniques work for education. Recently Macoto Murayama, a hacker/artist in Japan, has been creating virtual 3D flowers simply because his models are beautiful. 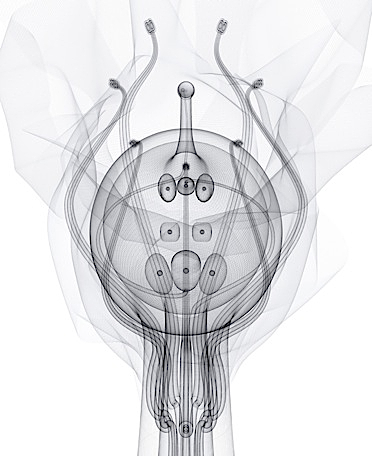 In March 2010 Wired magazine ran one picture of his work in the paper version (and more online), but I don’t think this image indicated the depth of his science. Murayama dissects flowers and with meticulous measurements and creates a virtual reproduction, which he then renders in various manners. Here is Murayama’s gallery account of what he does. 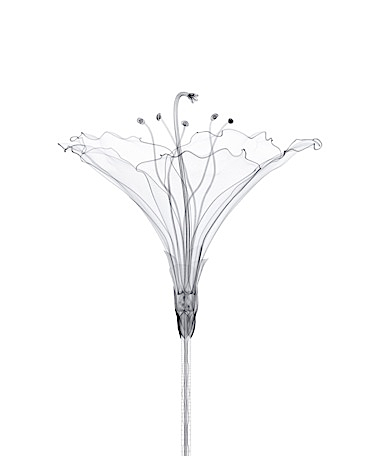 Macoto Murayama cultivates inorganic flora. First, he chooses the plant and finds the real flower. 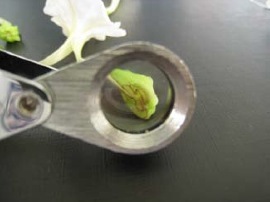 Second, he dissects the flower cutting the petal and ovary with scalpel and observes it with magnifying glass. 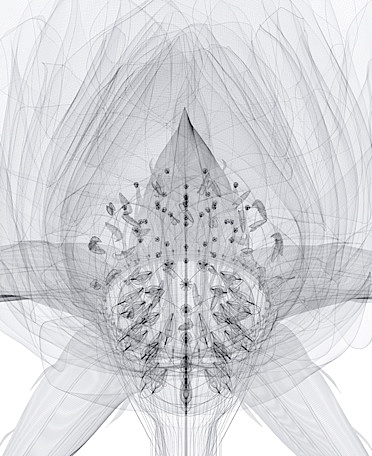 [picture above] Third, he makes sketches and photographs the parts of dissected flower. 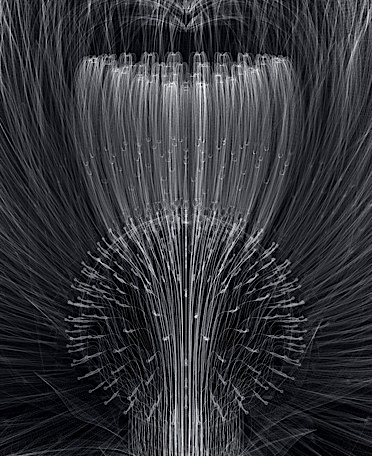 Forth, he models its form and structure using 3ds Max (3DCG software). Fifth, he renders separate parts and creates a composition using Adobe Photoshop. Sixth, he imposes measurements, parts names, scale, scientific name etc. Seventh, he prints out at large scale printer and frames it… Here it is, The Flower of Totalitarian Scientific Conscious: properly fixed, totally measured, strictly nominated and distinctly shown. It is not only an image of a plant, but representation of the intellect’s power and its elaborate tools for scrutinizing nature. Better than any words, some of his images show the patience of his monkish dedication and the power of visible structure. There are so many stunning images I find it hard to select which ones to spotlight. Here are four. Yes, you can purchase large prints of his works. They go for about $800 from his gallery. Inspiring. Have you seen the work of Ernst Haeckel? Monkish dedication describes this work precisely.